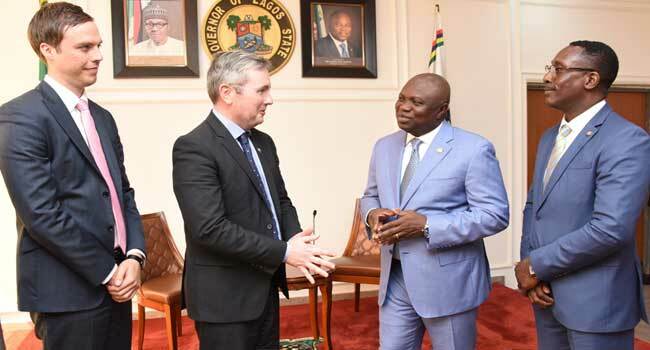 Lagos State Governor Akinwunmi Ambode recently hosted Australian High Commissioner to Nigeria, Paul Lehmann. The High Commissioner was received on Thursday, by the governor at Lagos House in Alausa, Ikeja. He was accompanied by Second Secretary, Australian High Commission, Nigeria, Fabien De Vel-Palumbo. Lagos State Commissioner for Transportation, Ladi Lawason and Commissioner for Special Duties and Inter-Governmental Relations, Oluseye Oladejo were also there to receive the High Commissioner. 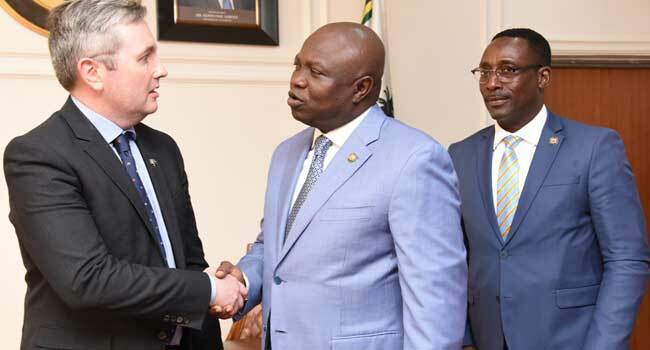 Lagos State Governor, Mr. Akinwunmi Ambode (middle), with Australian High Commissioner to Nigeria, Mr. Paul Lehmann (left) and Commissioner for Transportation, Mr. Ladi Lawason (right) during a courtesy call by the High Commissioner at Lagos House, Alausa, Ikeja, on Thursday, June 7, 2018. 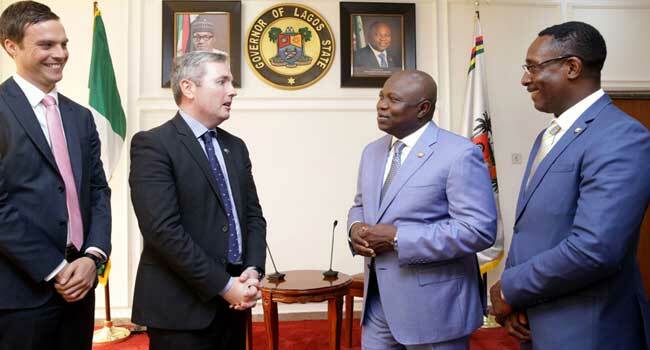 Lagos State Governor Akinwunmi Ambode (2nd right); Australian High Commissioner to Nigeria Paul Lehmann (2nd left); Second Secretary Australian High Commission, Nigeria, Fabien De Vel-Palumbo (left) and Commissioner for Transportation, Ladi Lawason (right) during a courtesy call by the High Commissioner at Lagos House, Alausa, Ikeja, on Thursday, June 7, 2018. 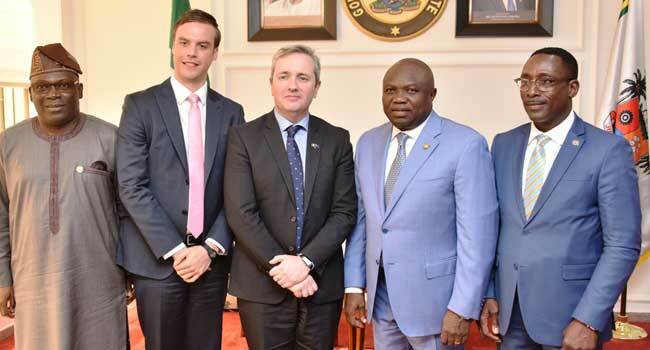 Lagos State Governor, Mr. Akinwunmi Ambode (2nd right), with Australian High Commissioner to Nigeria, Mr. Paul Lehmann (middle); Second Secretary, Australian High Commission, Nigeria, Mr. Fabien De Vel-Palumbo (2nd left); Commissioner for Special Duties & Inter-Governmental Relations, Mr. Oluseye Oladejo (left) and his counterpart for Transportation, Mr. Ladi Lawason (right) during a courtesy call by the Australian High Commissioner at Lagos House, Alausa, Ikeja, on Thursday, June 7, 2018.